Wire Brush Machine Wheels - Stainless Steel - Component Brushing. 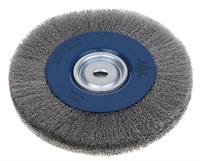 Applications: These wire brush wheels are for mounting on fixed or bench machines with rotaing shaft, hence ideal for applications where the work-piece can be carried and presented to the wheel. Widely used for stainless steel components and shaped parts to clean and brighten the metal. Product Notes: Includes a free set of mounting flanges for a range of diameters. Sizes include: 13mm, 16mm, 20mm, 22.2, 26, 30, 36 & 50mm. Wire gauge is 0.3, giving good flexibility for relatively gentle action to avoid scoring the work-piece. Made with AIS1302 grade stainless steel. Also Available: If you don't need stainless steel, we also stock lower priced machine wheels in brass coated steel.